So begins CLTC’s 2015 Annual Report, which chronicles the wide array of activities undertaken during the center’s first year. Download the PDF of the report here. * Expanded our team, including hiring Betsy Cooper, Executive Director; Jonathan Reiber, Senior Fellow; and Chuck Kapelke, Communications Coordinator. * Conceived, developed, and distributed five scenarios for the future of cybersecurity. * Allocated just under $900,000 in research grants to 19 projects across five departments. * Engaged in a number of C-level meetings with principals from top Silicon Valley firms and developed partnerships, in the United States and internationally, with institutions like the Center for a New American Security (CNAS), CyberSecurity Oxford, and the Berkeley Center for Law, Business, and the Economy (BCLBE). * Developed logo and branding materials, and launched the CLTC website and e-mail newsletter. 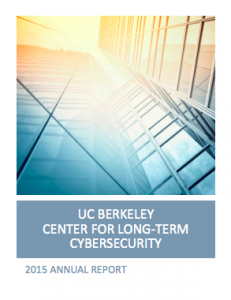 * Organized a seminar series, bringing to the UC Berkeley campus leading practitioners like Admiral Michael Rogers, Commander of CyberCom; Carey Nachenberg, Chief Architect, Security Technology, at Symantec; Joanne McNabb, Director of Privacy Education and Policy from the California Dept. of Justice; and Ashkan Soltani, then Chief Technologist of the Federal Trade Commission (FTC). Thank you to everyone who supported CLTC throughout 2015 (and beyond). We couldn’t have done it without you!